We are so proud to be releasing a new K-5 Learn to Code Curriculum at #ISTE2017. 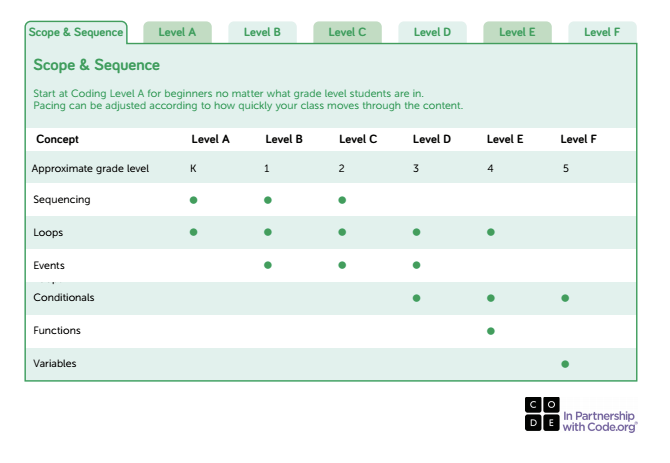 Whether you teach to the whole group or use a rotational station model, you will find lesson plans to introduce fundamental coding concepts, reinforce the skills with our in-app content that have step-by-step walkthroughs, and then have students practice independently using our 72 leveled Challenge Cards. Each Challenge Card has a story that engages your students in problem-solving to accomplish goals such as making Dash get down and boogie, helping Dash escape from the Dot monster, designing a game of Duck Duck Goose for Dot to play with friends, and more! Each level wraps up with recommended authentic assessment strategies and a capstone project. We’ve gathered so many fantastic ideas through our user research that we’ve even written a comprehensive Curriculum Guide to help walk you through all the implementation suggestions, recommendations, and best practices. Plus, we still are continuing to build our Code to Learn Lesson Library by writing and curating best-in-class, cross-curricular lesson plans. Once your students understand the fundamentals of coding and robotics, you can begin weaving Dash and Dot into your everyday classroom practices. Watch a new video featuring our Curriculum Designer, in which she describes our K-5 Learn to Code Curriculum. And stay up-to-date by following our new Facebook page for educators: www.facebook.com/TeachWonder.